George Herbert Walker Bush, who as the 41st president guided the United States out of the Cold War and led an international coalition into the Gulf War, has died. He was 94. 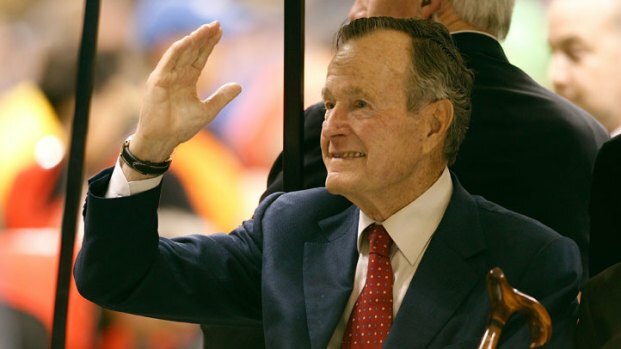 Bush died at 10:10 p.m. Friday, according to a statement from family spokesman Jim McGrath. "Jeb, Neil, Marvin, Doro, and I are saddened to announce that after 94 remarkable years, our dear Dad has died," said former President George W. Bush in a statement. "George H. W. Bush was a man of the highest character and the best dad a son or daughter could ask for. The entire Bush family is deeply grateful for 41’s life and love, for the compassion of those who have cared and prayed for Dad, and for the condolences of our friends and fellow citizens." Bush's final words were to his son George W. on Friday night, a source close to the family told NBC News. George W. Bush was on speakerphone to say goodbye to his father, telling him he had been a “wonderful dad” and that he loved him. “I love you, too,” H.W. Bush replied. The former president was quickly remembered as a humble patriot, dedicated public servant and beloved family man by President Donald Trump, former President Barack Obama and others. "Through his essential authenticity, disarming wit, and unwavering commitment to faith, family, and country, President Bush inspired generations of his fellow Americans to public service—to be, in his words, 'a thousand points of light' illuminating the greatness, hope, and opportunity of America to the world," Trump and first lady Melania Trump said in a statement." Bush was a World War II naval pilot who survived being shot down over the Pacific, led the CIA and spent eight years as vice president before taking the Oval Office. He was the father of the 43rd president, George W. Bush. His wife of 73 years, Barbara Bush, who used her time as the first lady to advocate for literacy, died on April 17. George H.W. Bush became the first former U.S. president to turn 94 on June 12. The nation's 41st president was receiving calls and taking it easy at his seaside home in Maine eight days after being released from a hospital where he was treated for low blood pressure, said Chief of Staff Jean Becker. Bush's office shared a birthday letter from the president in which he said, "My heart is full on the first day of my 95th year." "As many of you know, for years I have said the three most important things in life are faith, family and friends. My faith has never been stronger," the former president wrote in the letter. Several of his children had been in town, including former President George W. Bush, who posted a smiling photo of the two of them on Instagram. "I'm a lucky man to be named for George Bush and to be with `41' on his 94th birthday," wrote Bush, the nation's 43rd president. "I already miss the greatest human being that I will ever know. Love you Dad!" son John "Jeb" Bush wrote on Twitter. Another son, Neil Bush, called on people in a newspaper opinion piece to volunteer and "to become a point of light." The nation's 41st President George H.W. 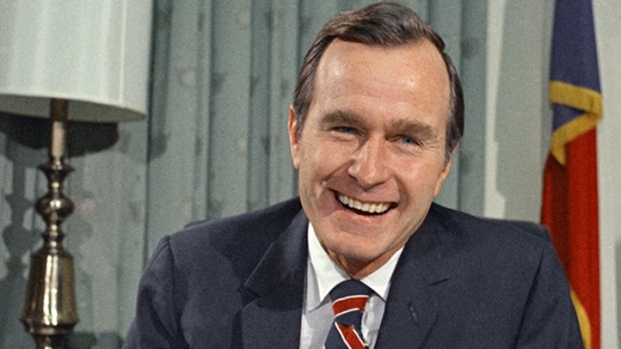 Bush, who on June 12 became the first former U.S. president to turn 94, died today. H.W. Bush, a Republican who served as President Ronald Reagan's vice president for two terms, was elected to the country's highest office in 1988. He beat Democrat Michael Dukakis in an electoral landslide and with 54 percent of the popular vote. In his inaugural presidential address, Bush spoke of "a thousand points of light" across the country, community organizations that were doing good and with which he promised to work. He pledged in "a moment rich with promise" to use American strength as "a force for good." A member of a longtime politically influential American family, Bush led the United States during a time of intense international change, including the fall of Communism in the former Soviet Union and Eastern Europe, and turmoil in the Middle East. His public approval rating soared to 89 percent after he presided over a U.S.-led coalition of 32 countries that drove Saddam Hussein's Iraqi army from Kuwait in 1991. After signing a strategic arms reduction agreement to reduce nuclear weapons with the Soviet Union's Mikhail Gorbachev, Bush accomplished a second agreement in early January 1993 with Russian President Boris Yeltsin after the USSR collapsed. "Even as president, with the most fascinating possible vantage point, there were times when I was so busy managing progress and helping to lead change that I didn't always show the joy that was in my heart," Bush said in his final State of the Union address. "But the biggest thing that has happened in the world in my life, in our lives, is this: By the grace of God, America won the Cold War." Despite his strength in foreign policy, Bush was ultimately limited to a single term as president over a sputtering U.S. economy. The unemployment rate, at 5.3 percent during his first year in office, rose to 7.4 percent in 1992. Confronted with rising deficits, Bush famously signed a bill that raised taxes despite the Republican's earlier campaign vow: "Read my lips: no new taxes." His public approval, once sky-high, plummeted in his final year in office to below 50 percent. While he lost re-election to Bill Clinton in 1992, his work laid a foundation for his son George W. Bush to win the White House in 2000. "Two presidents in one family, that's pretty good," George H.W. Bush told his granddaughter Jenna Bush Hager for a "Today" interview on his 88th birthday. Jeb Bush, a former governor of Florida, lost a bid for the Republican nomination in 2016 to Trump. Bush even saw his grandson, George P. Bush, enter politics. The Fort Worth resident won the position of Texas land commissioner in March 2014. George H.W. Bush was born June 12, 1924, in Milton, Massachusetts, the youngest of five children. He was raised in Connecticut by his mother Dorothy Walker Bush, and his father, Prescott Bush, who served as a U.S. senator. After the attack on Pearl Harbor, Bush enlisted in the military on his 18th birthday and became the Navy's youngest pilot at the time. He flew 58 combat missions in World War II before being shot down by the Japanese in 1944. Bush was rescued by a submarine and awarded the Distinguished Flying Cross for bravery in action. Back home, Bush married Barbara Pierce on Jan. 6, 1945, and the couple went on to have six children; George, Pauline (who was known as "Robin" and died as a child of leukemia), Jeb, Neil, Marvin and Dorothy. Bush was accepted to Yale University before enlistment, and once stateside, enrolled in an accelerated program that allowed him to graduate in two and a half years instead of four. While at Yale, the left-handed first baseman played in the first College World Series. In 1948, Bush graduated from the university with a bachelor of arts degree in economics. He moved the family to West Texas and achieved success in the oil industry, but like his father, he was drawn to politics. After an unsuccessful bid for the U.S. Senate in 1964, Bush won a House seat in 1966 representing Houston. He was re-elected in 1968 but gave up his seat two years later to run for the Senate again, and lost to Democrat Lloyd Bentsen. Bush was appointed to a string of government positions in the 1970s, including United Nations ambassador, Republican National Committee chairman, envoy to China, and CIA director. At the CIA he was credited with boosting morale. In 1980, Bush made a run for the White House, but the Republican Party nominated Reagan, who selected Bush as his running mate. The match was a good one. The pair went to Washington in 1981 and won a landslide re-election victory four years later. As vice-president, Bush traveled the world, pushing his anti-drug programs and became the first vice president to stand in as president while Reagan underwent surgery in 1985. Bush spent most of the eight hours on the tennis court. Then, after eight years of loyalty, Bush tried again for the Oval Office. Former First Lady Barbara Bush has died at the age of 92. She served as first lady from 1989 to 1993. Bush chose Indiana Sen. Dan Quayle as his running mate. At the Republican National Convention in New Orleans, Bush made the "no new taxes" pledge that would spark a backlash among some Republicans when he later reversed course. In 1988, Bush defeated Michael Dukakis and his running mate, Texas nemesis Lloyd Bentsen. He was sworn in as president on Jan. 20, 1989. Bush’s high popularity in the wake of a decision to send American troops into Panama to bring General Manuel Noriega to face drug charges in the U.S, and later the Persian Gulf War, would prove ephemeral. Bush described his defeat in his re-election bid as having given him a "terrible feeling, awful feeling." "I really wanted to win and worked hard. And later on, people said, 'well he didn’t really care', which is crazy," he told his granddaughter Jenna Bush Hager on "Today." "I worked my heart out and it was terrible to adjust. Well then you figure life goes on." After leaving office, Bush returned to private life by splitting his time between Kennebunkport, Maine, and Houston. It was not uncommon to see Bush 41 at a Houston Astros baseball game. In 2005, he teamed up with his former rival, Bill Clinton, to raise money for relief efforts after Hurricane Katrina and the Asian tsunami. His son George W. Bush published "41: A Portrait of My Father," in 2014, a wide-ranging and intimate biography of his father. In an interview on "Today" with his son and his granddaughter Bush Hager, the elder Bush talked about the intersection of family memories and key political events in their lives. Asked about his presidential legacy, Bush said that he'd banned the use of "the legacy word." "I think history will get it right, and point out the things I did wrong, and perhaps some of the things we did right," he said. In recent years, Bush was hospitalized because of various ailments. He broke a bone in his neck when he fell in his home in Kennebunkport, Maine, and suffered from shortness of breath and a bronchitis-related cough and other issues in Houston. 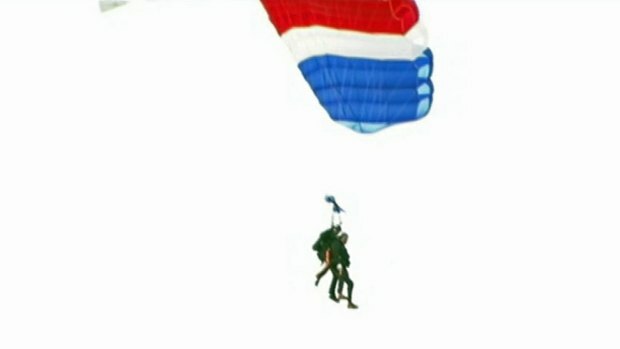 Bush also made headlines in recent years for skydiving on at least three of his birthdays, according to The Associated Press, the last on his 90th, when he made a tandem parachute jump in Kennebunkport, Maine. In the summer of 2016, Bush led a group of 40 wounded warriors on a fishing trip at the helm of his speedboat, three days after his 92nd birthday celebration. And he made headlines in July 2013 when he shaved his head in support of a little boy — the son of a member of his Secret Service detail — battling leukemia. Later that summer, he was honored at a White House event celebrating volunteerism. Bush put his presidential library at Texas A&M University in College Station and his name now is on the CIA headquarters, Houston's largest airport and a North Texas toll road. There is also an aircraft carrier that bears his name. In 2009, Bush 41 and Bush 43 attended the commissioning of the USS George H.W. Bush, the 10th and last Nimitz-class nuclear-powered aircraft carrier in the U.S. Navy. Bush had the distinction of being one of only three U.S. presidents to receive an honorary knighthood from Queen Elizabeth II. He was awarded the Medal of Freedom, the highest civilian honor, by President Barack Obama in 2011. Bush is survived by two siblings, his five children and many grandchildren and great-grandchildren. He was preceded in death by his wife of 73 years, Barbara; his second child, Pauline Robinson “Robin” Bush; and brothers Prescott and William “Bucky” Bush. He told Bush Hager that he was happiest while spending time with his family at sea. "Aging is all right," he said in June 2012. "It's better than the alternative, which is not being here." Air Force One is being sent to Texas to transport Bush's casket to Washington, where his body will lay in state at the Capitol Rotunda. The public can pay their respects from Monday evening through Wednesday morning. Bush will be buried Thursday on the grounds of his presidential library at Texas A&M University at the family plot next to his wife Barbara, who died in April, and their 3-year-old daughter Robin, who died in 1953. 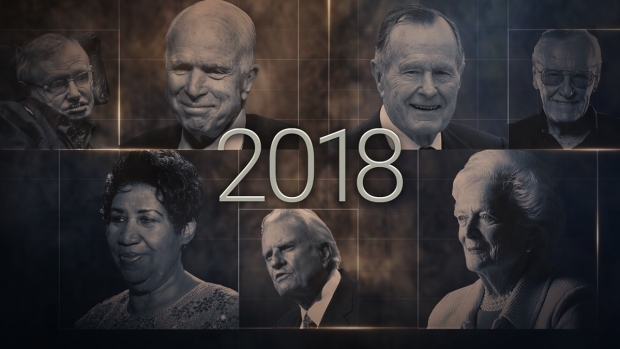 The Bush family is still arranging funeral services, but the White House said President Donald Trump and first lady Melania Trump plan to attend.